Our show website includes a few links to interesting online resources for teachers and parents. 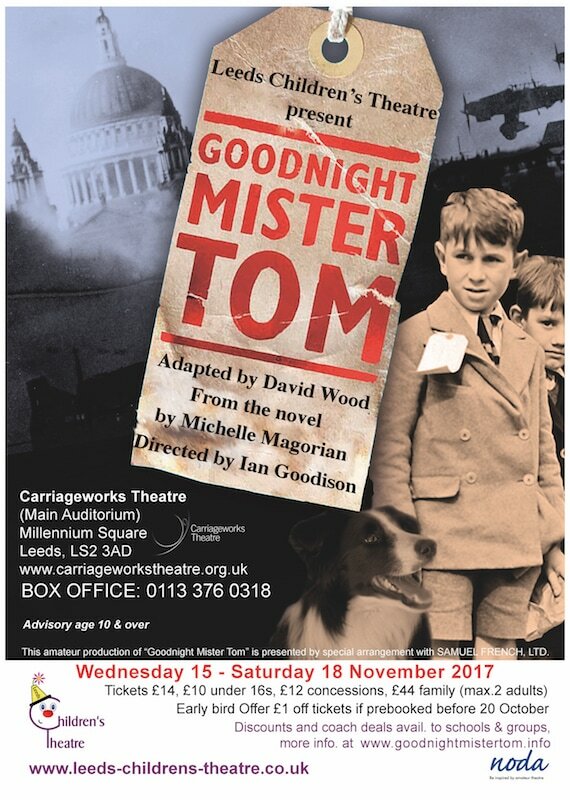 ​Michelle Magician's uplifting novel is enchantingly brought to life by Leeds Children's Theatre in this deeply moving stage adaptation by David Wood. Set during World War II, Goodnight Mr Tom tells the story of William Beech, a young boy evacuated from London to the unfamiliar English countryside. Here, William meets an elderly recluse Tom Oakley, who has withdrawn from society after the tragic death of his wife and child. The pair form an unlikely friendship which helps rebuild their lives. Just as everything seems perfect, William is cruelly summoned back to war-torn London by his deeply religious mother with shocking ramifications. Leeds Children's Theatre AGM 2017 This year's AGM was held on 15 September, and details of elected Officers and Committee Members are available on the website here. Details of membership fees for the 2017/18 season can be found online here. ​Our congratulations to the nominees and the winners this season. News blog has the details and pictures of our members receiving their awards.